9'x12' Multiple Sizes. AREA RUG PAD. Manufacturer: Carpenter Style: STAINMASTER Premium 1/2'' Visco-Elastic Memory Foam with DuPont(TM) Hytrel(R) RS renewably sourced(TM) film. For area rugs, runners and carpet. STAINMASTER 1/2" Visco-Elastic Memory Foam pad with DuPont(TM) Hytrel(R) RS renewably sourced(TM) moisture barrier breathable film. Enviro Step carpet cushion technology. This cushion can be easily cut down with sharp scissors. This pad is made in 6' wide goods only. We can put it together with carpet tape to make any width and length needed. 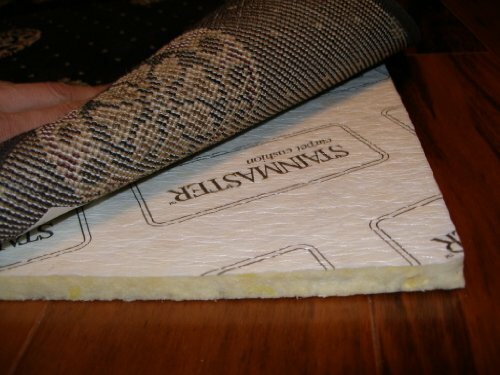 Premium rebond cushion made in the USA by Carpenter. CRI green label for air quality assurance. Reduces impact noise to make homes quieter. Insulates floors to help resist energy loss. ORGANIC POLYOL. Ozone friendly. CRI green label certified for air quality standards. This is a full 1/2" pad! Spillguard barrier technology. Spillguard moisture barrier prevents spills and accidents from penetrating the cushion, so they can be blotted from the carpet quickly and easily. Spillguard utilizes DuPont Active Layer RS renewably sourced moisture barrier film, which contains a minimum of 20% renewably sourced ingredients by weight. Visco-Elastic Memory Foam redistributes weight and surface pressure for the ultimate in comfort. Ozone friendly. Soft Slip technology. Stainmaster extends all Stainmaster carpet warranties by 3 years. This product is 100% recyclable. The right choice for your home. The right choice for the environment. 1/2" MEMORY FOAM PADDING. By far the DENSEST Visco-Elastic MEMORY FOAM cushion for the feel under your feet. A full 1/2" THICK pad! Makes any carpet or rug feel more luxurious under foot. Protects your investment by enhancing carpet performance. DuPont(TM) Hytrel(R) RS renewably sourced(TM) moisture barrier breathable film. If you have any questions about this product by Carpenter, contact us by completing and submitting the form below. If you are looking for a specif part number, please include it with your message.